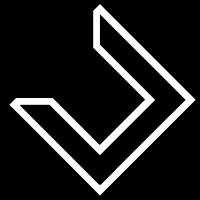 Did you update the wordmarks on the original post? Not on the original, no. I'll probably go back and do that tonight. 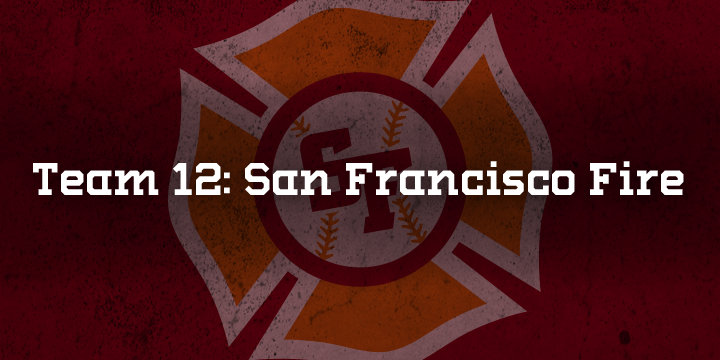 The San Francisco Fire were on fire late last season--but the key in that phrase is were. The club came to the Bay Area as an expansion team along with Portland and Boston, bringing the league to an even 18 teams. The nickname Fire was chosen in reference to the fires that resulted from the 1906 earthquake in the city, as well as how popular baseball was starting to become in Northern California--a newspaper article in 1981 said the sport was spreading like wildfire, and was eventually adopted as the name. For years, the Fire struggled by the Bay, as they were consistently in the bottom level of attendance and a perrennial losing team. In fact, they didnt have a winning season until 2008, which is still the longest streak in all of sports. They missed the playoffs every year save for 2011 and 2014, both of which were third place finishes. Last season, the Fire got hot at just the right time--they lost six games over the final 5 weeks of the season, including two streaks of 10 or more wins. All of this was done without the leadership of their 33-year-old shortstop, Orlando Gonzalez, whose season was cut short with a back injury in June. Their playoff appearance was unlikely, but taking the title in St. Louis in 5 games was even moreso. In the offseason, the Fire soon became a dumpster fire. A month after the season, their manager retired from coaching due to medical concerns. Their top two pitchers left town for the free agent market, and their shoes were never filled. 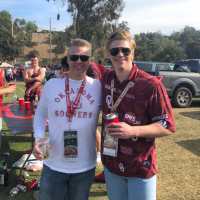 Cliff Butchergrass, their new skipper, was essentially hired off the street--he hails from a local high school in the Oakland area and has no collegiate or professional coaching experience. Fans say hes run the team into the ground, but he stresses the word rebuilding. Their lone hope is Gonzalez, but even he wont be around forever. This season will certainly be a struggle, but Butchergrass is hoping for big things in the future. San Franciscos club is represented by a unique and classy identity, but one that is several tweaks from being top flight. The cap logo acts as a primary, playing off of fireman imagery, which is a look the team has embraced very well. That logo also adorns the left chest of the home and red alternate jerseys, which is one of the leagues signature looks. The road uni? Yikes. Fans dont really appreciate the uniqueness of the stacked San Francisco script, even though it has been around for the majority of the teams existence. 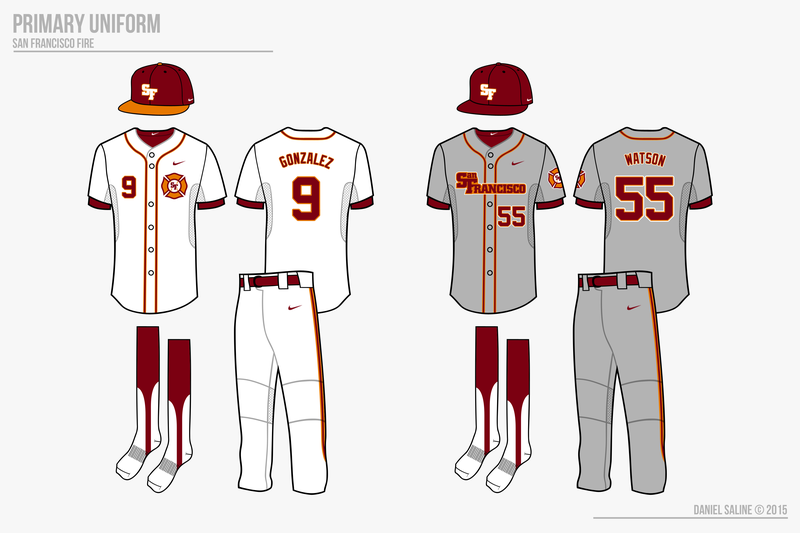 Many call for a grey version of the home uniform, which the team is looking into in the next couple seasons. 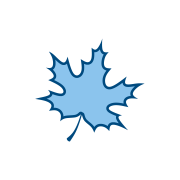 The orange alt was added in 2013 with the Fire in cursive. The tail from the script was dropped so that it would better fit on the jersey. 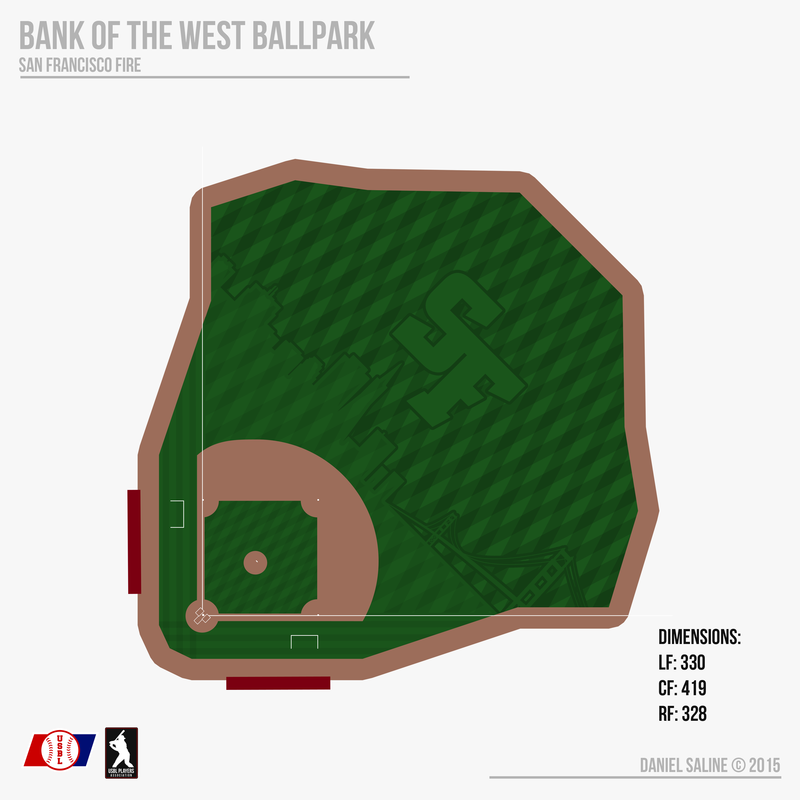 Bank of the West Ballpark is a bad situation for the Fire. It was originally designed as an all-purpose field, not just baseball, as it has hosted seven sports since it opened. The location is not ideal, and the centerfield view isnt exactly pleasing, either. The team is pushing for a new field, hopefully by the bay, but the city doesnt want to pay the money, and the fans dont particularly want a publicly funded stadium. Their window in San Francisco may be closing, but the hope is that the recent championship will provide some fuel for that fire. Thanks for taking a look! I'm gone the next three days so I may not be able to make any updates, but I wanted to get this out there. The orange jersey is fire, literally. Great work overall, but I think the Opening Day set could use more gold. It doesn't look any different unless you zoom in. I don't like how the -an in San Francisco is much smaller than the rest of the text, but other than that this is a solid look. Great job. I agree. I don't think the hat logo works on the jersey. It would look great as a sleeve patch, but the SF is too small on the jersey. (As a side note, it might be too small on the hat too.) 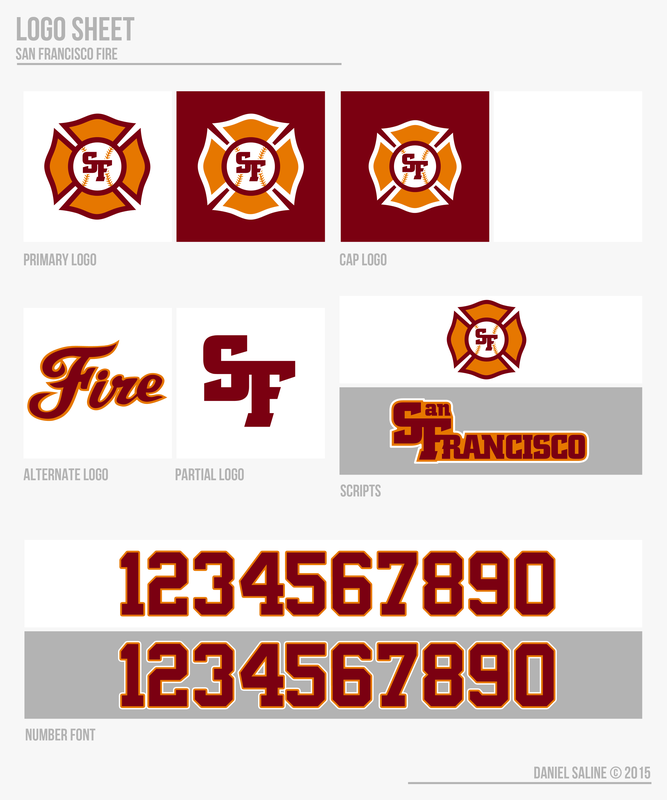 For the jerseys I would suggest you either use the partial logo (SF) on the chest or the Fire script. The hat would probably also look better with only the partial logo, but I understand that you want to do something different. 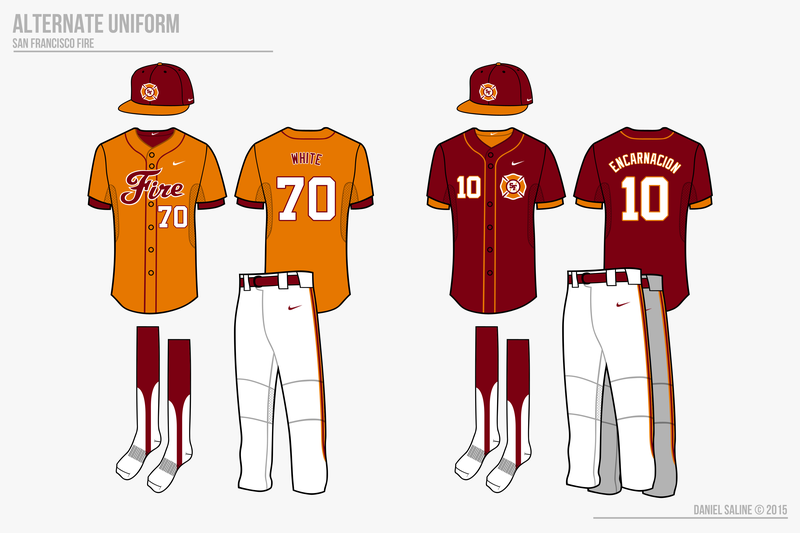 In theory, the letters would be similar to the Reds or Cubs home jerseys, but I suppose I didn't nail the execution. I can alter it so the SF is bigger and more pronounced on the jerseys, and perhaps take out the laces on the chest. As for the hat, I could do the SF or just the fireman rounded with no monogram. 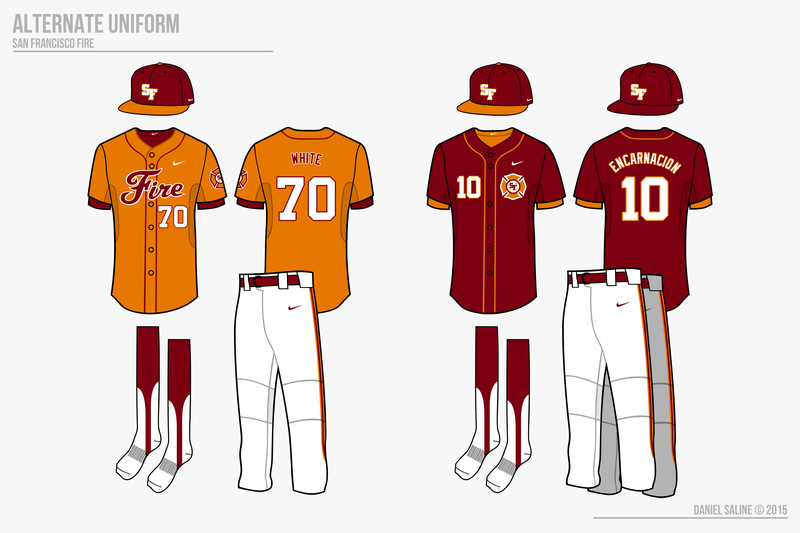 I don't really want the Fire script on the home or red jerseys, but I'll try and perfect it the best I can. Thanks for the comments! 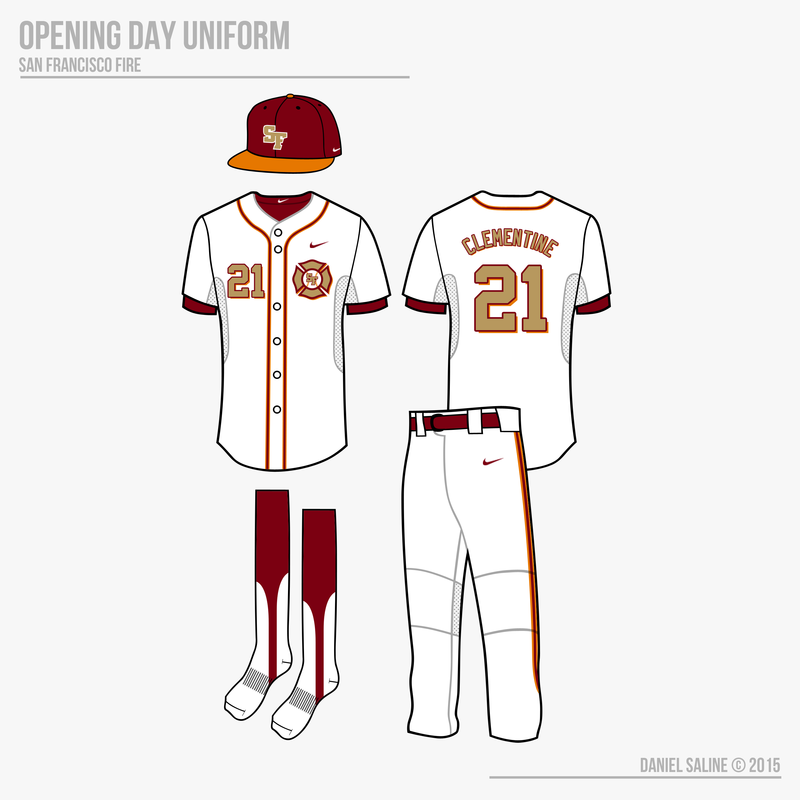 Everything looks good but I agree with rsaline, the Opening Day uniform needs more gold. 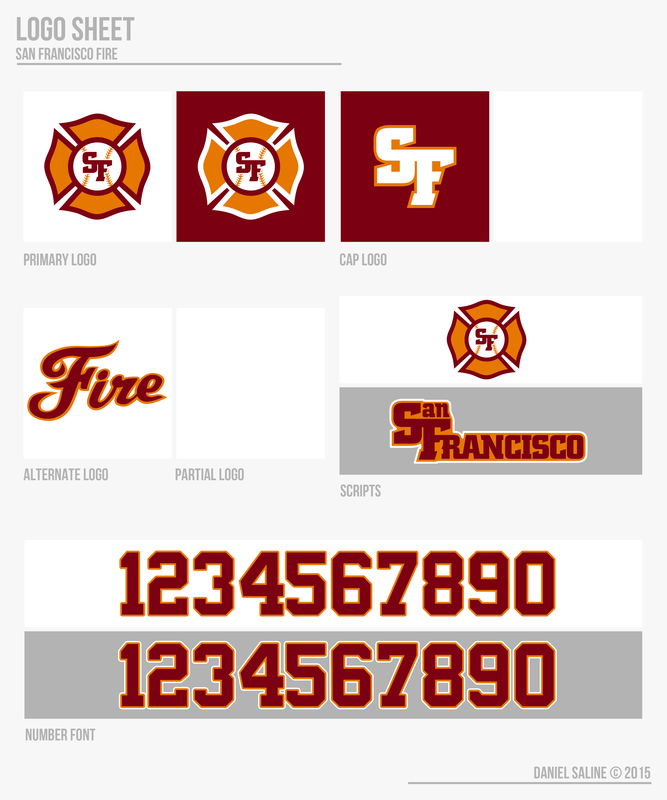 Wow, the logos and uniforms for San Fran look awesome, great work overall in this thread. I actually like the primary logo on the jerseys. The Cubs and Reds comparisons are spot-on, and I think the look definitely works. I wouldn't change anything with the logo. I would go with the interlocking "SF" on the hat though. The primary is much too detailed—it would be like the Cubs putting their primary logo on the hat. I also kind of dig the road script. It's quirky. And the "Fire" script is most certainly fire. I would consider putting it on the red jersey. Then maybe you could add the primary to the sleeves of the road and alts (if you take it off the hat). That way it appears on every jersey. Why do the Fire have the golden uniforms if they haven't won a title? Or are you doing that for every team? Can't believe I forgot to talk about the grass. The Fire used to alternate designs every month or so, just like a lot of USBL teams do. The groundscrew mowed a Golden Gate Bridge design into the outfield, and the fans loved it. Eventually it expanded to a skyline of San Francisco and has been kept ever since. If and when the Fire get a new ballpark, this is one thing they may keep. San Fran looks good. That field is sick! I like the logo, I would just do as suggested by others, put the SF on the cap instead of the primary logo. And the opening day jersey I agree needs more gold. To me it doesnt really look much different from the original home jersey. I was expecting a gold jersey, not white. great looking series so far. i echo most and would switch the red trim / pipping / number out with the gold for the "world champions" jersey, to really bring out the gold. similar to what the giants have done for their three gold based ring ceremony jerseys. also, what template are you using, looks amazing. I might go with gold lettering and numbers like the MLB ring ceremony jerseys of late.